The part of the electromagnetic spectrum described as VLF generally spans 3 - 30 kHz, although many researchers tend to "fuzz" the upper and lower frequency limits somewhat. Most ground-based observations in the VLF band are dominated by the strong impulsive signals radiated by lightning discharges. These produce significant electromagnetic power from a few hertz to several hundred megahertz [Magono, 1980], with the bulk of the energy radiated in the frequency bands <30 kHz, and thus VLF and below. At VLF such pulses are termed "atmospherics", or simply "sferics". Except at the highest latitudes, long term noise surveys undertaken in this band contain essentially no contribution from other natural radio noise sources [Smith, 1995]. At frequencies >10 kHz man-made transmissions from communication and navigation transmitters can be observed in almost every part of the world. A number of nations currently operate large VLF transmitters, primarily for communication with military submarines. While such transmitters originally served some commercial and governmental purpose, particularly for those nations involved in the building and maintenance of far-flung colonial empires [Byron, 1996], permanent operation is now usually only undertaken for military communications. To radiate electromagnetic waves efficiently one needs an antenna whose dimensions are of the order of the wavelength of the radiation. VLF waves, with frequencies from 3 to 30 kHz, have wavelengths from 100 to 10 km and this suggests that VLF antennas must be extremely large to be efficient. Examples of this are shown in Figures 1 and 2. Figure 1 shows the ~450 m towers which make up the US Navy VLF transmitter in Hawaii, while Figure 2 is a satellite image of the US Navy transmitter at North West Cape, Australia. Ground based vertical electric monopole antenna can operate at reasonable efficiency at VLF, especially at frequencies >10 kHz, and were the mainstay of VLF communications systems for most of the 20th century. Such antennas are very large, typically many hundreds of metres long and are usually strung between high towers. However, VLF antennas often make use of natural geographic features, and have been strung across Fjords in Norway and over extinct volcanoes in Hawaii. The problem of scale in VLF antenna has been a challenge to radio engineers. Figure 1. Assoc. 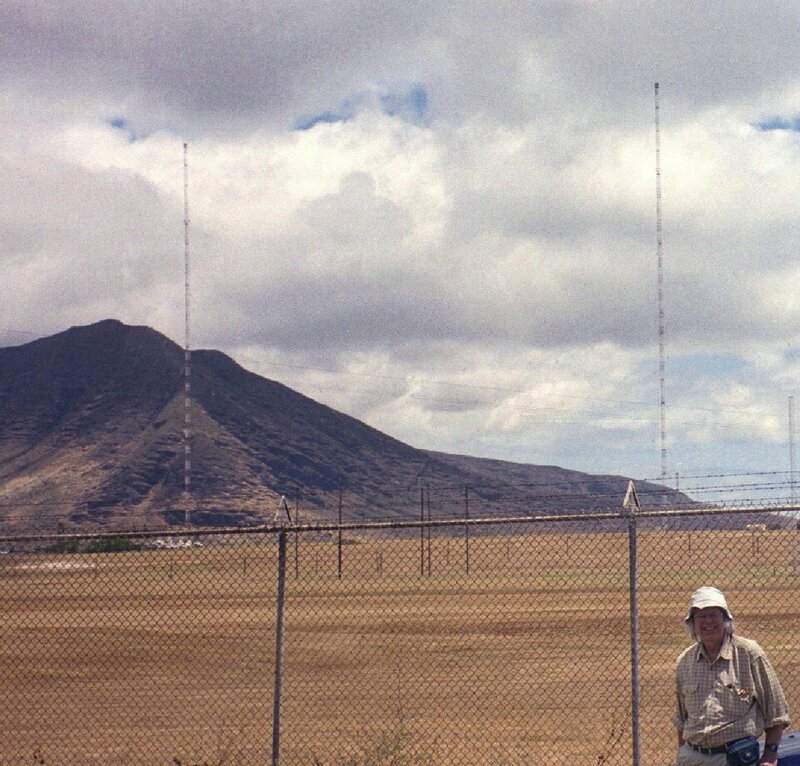 Prof. Neil Thomson stands in front of the towers of the US Navy VLF transmitter, at Lualualei, Hawaii. This transmitter has radiated power of ~500 kW operating at frequency of 21.4 kHz. The towers in the background are ~460 meters high each. Neil was visiting Hawaii to undertake measurements of the signals from this transmitter at very close range [August 2006]. Figure 2. 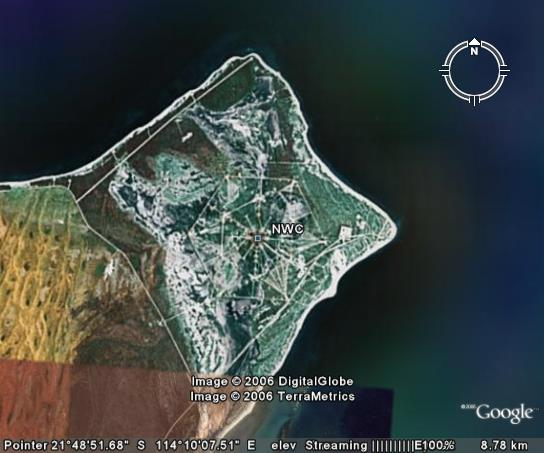 Satellite image of the US Navy VLF transmitter station at North West Cape, Australia, seen from an altitude of ~8.8 km. Image courtesy of GoogleEarth. However, military users continue to value the huge areas which can be covered from a single transmitter (>10 Mm), as well as the skin depth implications offered by VLF frequencies (extremely important in the age of ballistic missile submarines). These benefits overcome the prime limitations of such transmitters: small usable bandwidths (~20-150 Hz), and low transmitter radiation efficiencies (~10-20%; Watt ). A selection of communications transmitters is given in Table 1. In addition to communication stations, there have also been networks of navigation beacons operating in the VLF band. Examples are the world-wide Omega network broadcasting between 10.2 and 13.6 kHz (which ceased operation at 0300 UT, 30 September 1997) and the Russian "Alpha" network from 11.9 to 14.9 kHz. Table 1 List of some operational VLF transmitters. The transmitters are generally referred to by their call-sign (e.g., NWC for the very powerful transmitter in Western Australia). This information is drawn from Table 2 of Clilverd et al. . In some parts of the world the VLF band is also strongly dominated by man-made radiation. Harmonics of the electrical network transmission frequencies (typically 50 Hz or 60 Hz) can be significant in much of the ELF/band. From a scientific viewpoint such radiation is simply a source of noise, although some have suggested it may influence the magnetosphere [e.g., Bullough, 1995] although this has been disputed [Rodger et al., 2000, and references therein]. Most of the energy radiated by lightning discharges and manmade VLF transmitters is trapped between the conducting ground (or sea) and the lower part of the ionosphere, forming the Earth-ionosphere waveguide. Such radiation is said to be propagating "subionospherically", i.e., beneath the ionosphere, shown schematically in Figure 3. While the creation and operation of manmade VLF transmitters is generally due to military requirements, the scientific use of the transmissions from these stations is well recognised [see the discussion in Barr et al., 2001]. Because of the frequencies at which these transmitters broadcast, their high radiated power, and their nearly continuous operation, they are extremely well suited to long-range remote sensing of the lower ionosphere. Subionospheric VLF signals reflect from the D-region of the ionosphere, probably the least studied region of the Earth’s atmosphere. These altitudes (~70–90 km) are far too high for balloons and too low for most satellites, making in situ measurements extremely rare. Rocket lofted experiments have taken place in the D-region, but can only provide limited coverage due to their very nature. Radio soundings made at frequencies >1 MHz (e.g., ionosondes), while successful for observing the upper ionosphere, generally fail in the D-region. The low electron number densities at D-region altitudes produce weak reflections, and hence measurement difficulties, particularly at night. Figure 3. Schematic of subionospheric VLF propagation. VLF transmissions propagate in the waveguide formed by the Earth and the lower edge of the ionosphere (for night time ~85 km). One of the few experimental techniques which can probe these altitudes uses very low-frequency electromagnetic radiation trapped between the lower ionosphere and the Earth [Wait, 1996]. Observations of the amplitude and/or phase of VLF transmissions have provided information on the variation of the D-region, both spatially and temporally. A schematic of subionospheric propagation is shown in Figure V. The nature of the received radio waves is largely determined by propagation between these boundaries [e.g., Cummer, 2000]. Very-long range remote sensing is possible; these signals can be received thousands of kilometres from the source [Crombie, 1964]. In contrast, incoherent scatter radar techniques can make measurements in the D-region and above [e.g., Turunen, 1996], but are limited to essentially overhead measurements. By using multiple VLF communication transmitters some understanding has been gained of the daytime lower ionosphere [McRae and Thomson, 2000]. This method has not worked as well at nighttime, where the limited number of fixed paths (transmitter–receiver) has been insufficient to understand the complex nature of the lower ionosphere. It appears likely that a much larger number of transmitter–receiver paths is required to understand the nighttime D-region. Two approaches might be considered. Obviously, one might use existing transmitters and deploy a large array of receivers, now undertaken in some regions leading and providing promising results [e.g., Bainbridge and Inan, 2003]. Another very promising approach is to expand the network of transmitters, not by building new ones, but rather by making use of the powerful natural radio discharges produced by lightning. The radiated waves can be used as probes to study the medium's electrical properties [e.g., Cummer et al., 1998], acting much like natural radar pulses. This use of lightning pulses provides a very large range of paths, equivalent to a huge number of transmitter locations, and is therefore rather scientifically efficient, while also being rather cost effective. In addition to subionospheric transmissions, a very small percentage of the energy radiated by the transmitter can "leak" through the ionosphere into the magnetosphere and travel roughly along geomagnetic field lines into the conjugate hemisphere. Such signals are also used as scientific probes, with modern techniques making use of cross-correlation detection to monitor VLF transmissions which have travelled in the whistler-mode through the magnetosphere (see Thomson et al. , and references therein). Variations in the ionospheric D-region lead to changes in the propagation conditions for VLF waves propagating subionospherically, and hence changes in the observed amplitude and phase of VLF transmissions. Variations in time and space in the ground plate of the waveguide can also lead to changes in VLF propagation conditions (e.g. reflections from mountain ranges [Barr and Armstrong, 1996]). However, for a fixed transmitter-receiver combination variations over time in the "Earth plate" of the waveguide have not (thus far) been shown to produce detectable changes in VLF propagation. 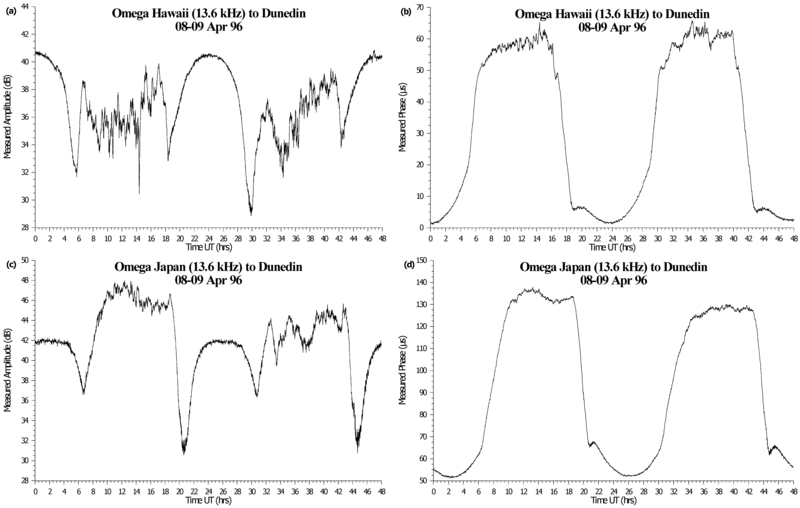 For daytime propagation conditions the D-region is particularly stable, with reflection heights occurring at about 70-75 km, the variation being strongly dominated by the change in Lyman-α flux with solar zenith angle [McRae and Thomson, 2000]. By day the propagation paths are largely stable and the received phases are reproducible, in quiet conditions away from dawn and dusk, to a very few microseconds or better than ~10 degrees [e.g., Watt, 1967; McRae and Thomson, 2000]. Because of this the amplitude and phase of fixed frequency VLF transmissions varies in a consistent way during undisturbed conditions, as shown in Figure W. Note that phase and amplitude vary in a fairly consistent manner when the transmitter-receiver path is in day time conditions (smooth variation). Night-time propagation at VLF frequencies is less stable and predictable than for day-time paths, although sufficient for communications purposes. The difference in stability reflects short-term variation in the night-time D-region and the lack of a dominant energy source (c.f. the Sun in daytime). In this case reflection heights occur at about 80-90 km altitude. The variations in phase and especially in amplitude can be clearly seen in the disturbed sections of Figure 4. Figure 4. The amplitude and phase of fixed frequency VLF transmissions from navigation beacons received at Dunedin, New Zealand [McRae, 2000]. In general, the largest changes in VLF subionospheric propagation conditions are the diurnal variations. In daytime conditions few ionospheric modifications dominate over the "normal" energy inputs from the Sun, and hence subionospheric VLF is a less useful tool for daylit transmitter-receiver paths. Nonetheless, variations are observed in daytime conditions. For example, when a solar flare affects a sunlit transmitter-receiver path, the increase in X-rays creates extra ionisation, lowering the effective reflection height of the ionosphere and advances the phase at the receiver by an amount that depends on the intensity of the X-ray flux [e.g., Mitra, 1974]. An X5 flare lowers the effective reflection height from ~70 km (mid-day) to ~58 km [McRae and Thomson, 2004], while the largest flare recorded to date (an X45) lowered the VLF reflection height to ~53 km [Thomson et al., 2004]. The change in propagation conditions follows the X-ray flux, increasing dramatically within a few minutes of the flare onset, and then typically decays again over periods ranging from a few tens of minutes to several hours. Generally, however, transient VLF perturbations are observed for transmitter-receiver paths under nighttime conditions, examples being perturbations due to whistler induced electron precipitation and red sprites. A rare example of a nighttime VLF perturbations lasting ~5 min have been observed due to a gamma ray flare produced by a neutron star 23,000 light years away [Inan et al., 1999]. The amplitude changes were on the same order as between daytime and nighttime conditions, with maximum changes of ~24 dB in amplitude and ~65º in phase observed on the transmitter-receiver path from the VLF transmitter NPM (Hawaii) to Palmer (Antarctica). At the far extreme of future possibilities (one hopes), the 400 km altitude high-atmospheric detonation of a 1.4-megaton thermonuclear weapon produced a maximum change of ~175º in phase [Zmuda et al., 1963]. Recently a full tutorial on VLF waveguide propagation has been published in the AIP Conference Proceedings. The abstract is copied below, along with a link to the article which some readers may find valuable. In recent times, research has moved towards using VLF radio transmissions propagating in the earth-ionosphere waveguide as a detector of a variety of transient geophysical phenomena. A correct interpretation of such results depends critically on understanding the propagation characteristics of the path being monitored. The observed effects will vary depending on time of day, path length, path orientation, magnetic latitude and VLF frequency. This paper provides a brief tutorial of the relevant propagation dependencies for medium to long VLF paths best understood in terms of waveguide mode theory together with results either not previously published, not published in the open scientific literature or whose significance has been little recognised. References for the papers cited in this background material piece are listed together on another webpage. Rodger, C. J., and R. J. McCormick, Remote sensing of the upper atmosphere by VLF, lecture notes provided to students of the NATO Advanced Study Institute from 21-30 July 2004, 1-90 pages, URL: www.bath.ac.uk/~eesmf/SUMMER/MS/rodger.pdf, 2004.